Congress president Rahul Gandhi has started his Kailash Mansarovar Yatra and posted pictures from his first day of his yatra and interestingly there were none of the photographs featuring him. Well, in no time, Rahu Gandhi slipped into a trollers world as people started commenting on his pictures saying he is not undertaking the yatra and the pictures are being stolen from the internet. Posting a picture of Kailash Mansarovar, he had said on Twitter that there is no hatred there. "The waters of lake Mansarovar are so gentle, tranquil and calm. They give everything and lose nothing. Anyone can drink from them. There is no hatred here. This is why we worship these waters in India." He added that a man goes to Kailash when it calls him. 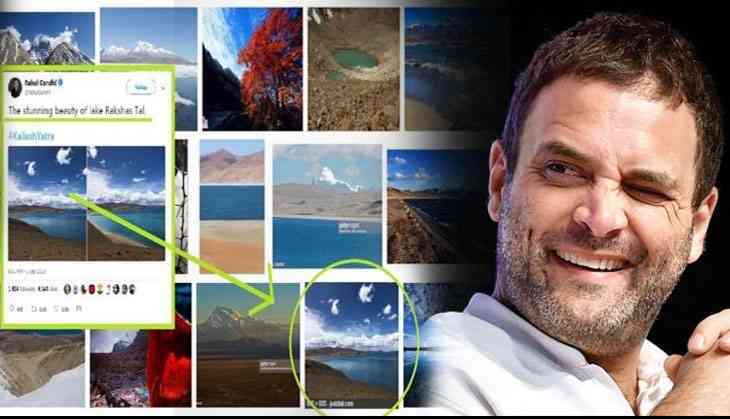 Rahul Gandhi shared a photo of the spot he visited like Rakshas Tal and Twitter started its investigation and scanned the pictures and dug out that the images he has shared are from Google search of the Mansarovar. Internet se download kar ke pic tweet kar raha hai rahul kya sachhi me mansarovar gaya hai?? Do you think Rahul Gandhi has Googled the pictures and shared it by stealing from the internet?